Piso Fare 2019 Promos Until 2020: Piso Sale for Summer 2016! Piso Sale for Summer 2016! Piso Fare 2016: Soon, we two are standing still in time with the new seat sale! Book now until Mar 3! 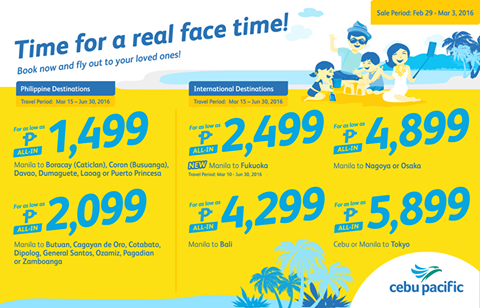 Here's a cheaper fare to Boracay (via Caticlan) or check out Coron in Busuanga. When you visit Dumaguete, you can take home the famous silvanas. You will also have an option to visit Puerto Princesa and explore the underground river! If you want some international flights, there are affordable rates going to Bali, Narita (Japan). So do your travel research. If you need a VISA, make sure to process them right away! Kailan po ba susunod na promo?? may piso fare pa po ba this coming April ? Php 499 Affordable Fare after Piso Fare!